Ezard at Levantine Hill is a gastronomic collaboration between hatted chef Teage Ezard and the winery, and Microflite can take you there in style. Choose from three sumptuous options. 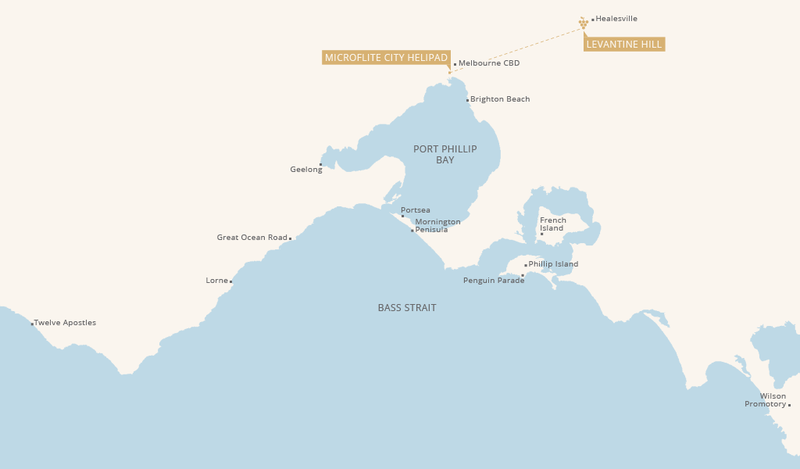 Return flights from Melbourne City to Levantine Hill. Selection of sharing plates from the Ezard All Day Dining menu. Glass of Levantine Hill Estate Rosé or Sauvignon Blanc Semillon. Glass of Coldstream Guard Rubeus (Cabernet blend) or Coldstream Guard Pinot Noir. Tasting of five Levantine Hill wines from the Coldstream Guard range, Estate range and Family Paddock range. Standard five-course degustation lunch with matched wines in the Signature Restaurant. A premium wine tasting from the museum and current release collection in the exclusive Storrier Room ( 8-20 guests), a premium booth (4-8 guests) or at the Cellar Door. Eight-course degustation lunch and matched wines in the Signature Restaurant. Levantine Hill Estate Signature gift bag. Not available Tuesday. If you would like to make a booking for 19+ passengers please contact our office on (03) 8587 9700.